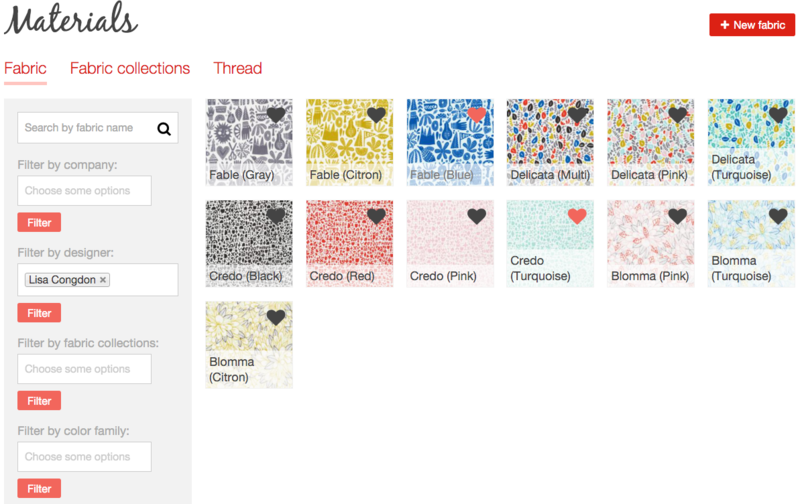 One of the questions that keeps coming up is how to stash fabrics and add to Textillia's fabric database. How does the fabric database work? 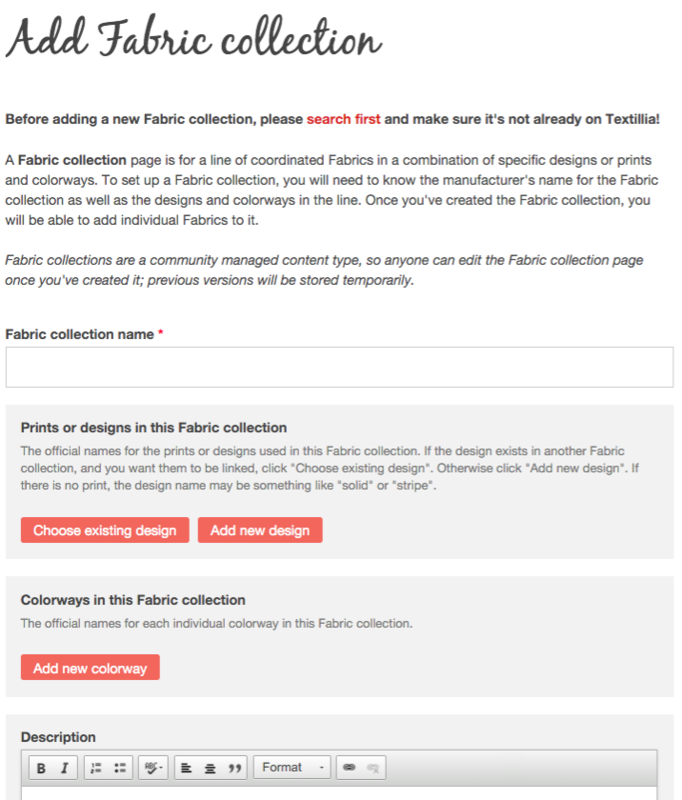 The fabric (and fabric collections) database is a subset of the "Materials" section of Textillia, which currently contains fabrics, fabric collections, and thread, and will likely someday contain other things like notions and other tools. The fabrics that are already in Textillia's database have been added either by me or by other site members. 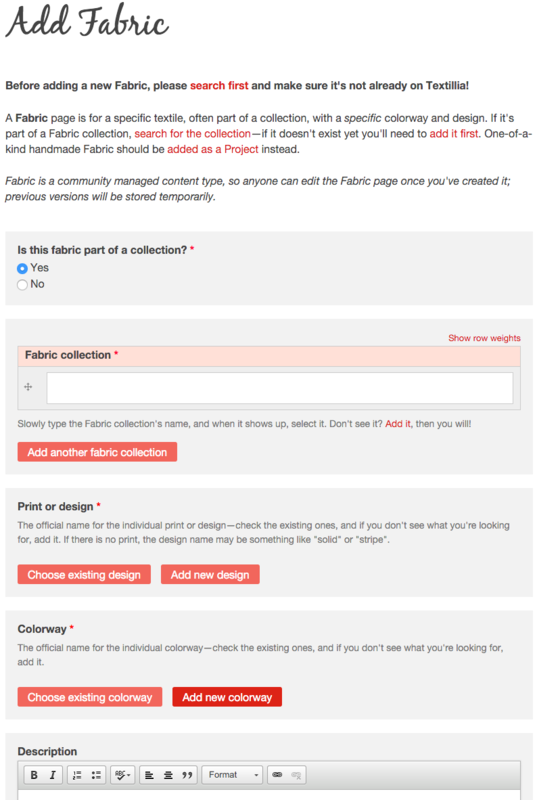 Anyone can add fabric, fabric collections, thread, and patterns to the main database - we think of these as the "community managed" content types. It might be a surprise that anyone can add and edit these kinds of content, but the reality is that if I tried to add all known fabrics to the database myself, it would take my entire lifetime and then some! We can build it a LOT faster working together. Bruno and I have a background in open source software (that's software where the code can be viewed and altered by people who use it), and for many years we've worked together with thousands of other people around the world to help build the software that Textillia runs on now. When we first started working with this software in the mid 2000's, before we'd even met each other, it was used for tiny websites with a few pages, or for people's personal blogs. Today, a decade later, it's being used to run Whitehouse.gov and hundreds of other very large, important websites. (Which I'm only realizing as I write this means that for about a year when I co-led the documentation team, my name was in the code of Whitehouse.gov...whoa! Anyway, I digress...) Over a million people are members of the software development community, and almost 100,000 have contributed code to the project. My point is, we've seen what a large group of committed enthusiasts can do. It is the reason why we want Textillia to be a community-centered project, so that all of us can work together to do what only a few of us could never accomplish alone: create the ultimate database of fabric and patterns! Right now, this information is scattered all over the internet, and much of it gets lost after fabrics go out of production. We finally have a chance to document it all in one central place, and then reference it easily on the projects we all make. Use fine grained search filters on the fabric and fabric collection landing pages, so that if you want to find all yellow fabrics or all flannels or only yellow flannels, you can do exactly that in a few quick clicks. Group fabrics as part of a collection, for example Made By Rae & Cloud9's Fanfare reprint for 2014. You can see on the Fanfare 2014 page that Fanfare 2013 is a related collection, and some fabrics belong to both collections. 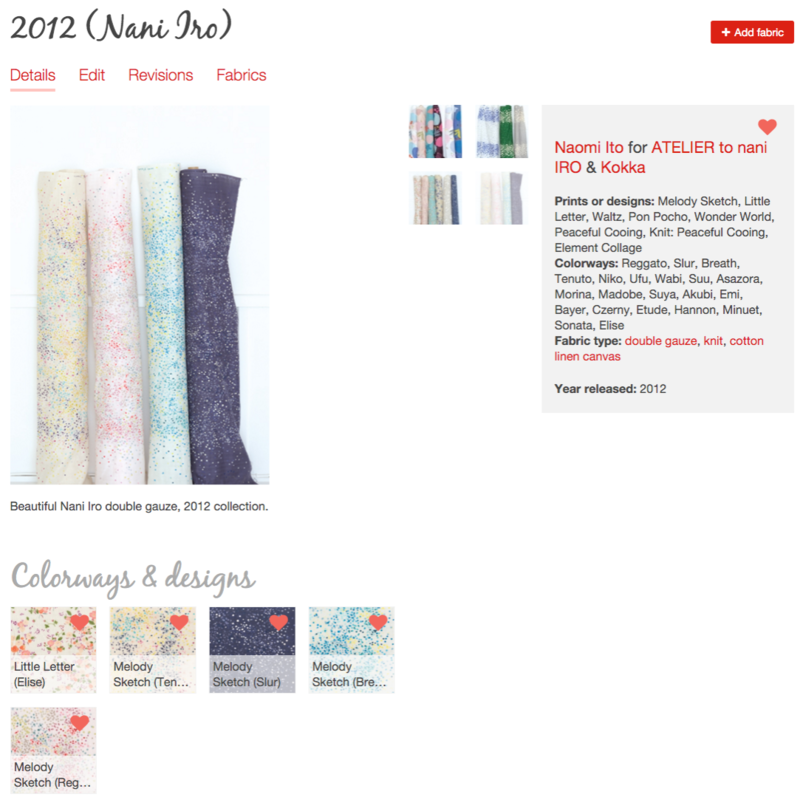 You can see all the colorways and designs available for that collection below, and then in the sidebar all kinds of info about who designed and produced the fabrics, including what fabric types it includes, and even whether it's had any sustainability certifications. You can click through all those links to go off and find more information about all those things too. Connect fabrics to projects, so that when you look at the projects tab of a specific fabric, all the projects in the database using that fabric show up, for example on the Nani Iro Melody Sketch print in Reggato colorway, I've made three projects using that fabric and they all show up on the fabric's projects tab. 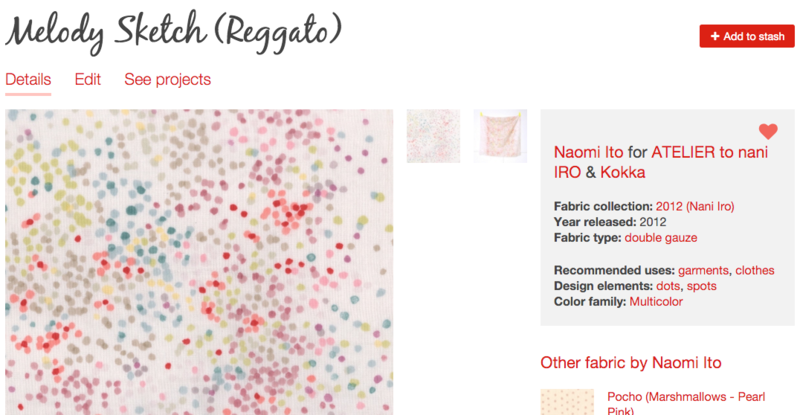 From there you can view the projects or go see what other fabrics Naomi Ito has designed or Kokka has manufactured. When you're on a project, pattern, fabric, designer page, or company page there are all the other interconnected pieces of information you can follow to learn more. All of this functionality is based on the existence of fabrics and patterns in the database, and all their related information that's been entered. Why add a fabric to the database? Adding the fabric to the database is what makes everything above possible! It creates a hub to connect all of this other information around it, which is at the core of how Textillia works! Adding what you know about a fabric starts the process of documenting complete information about the fabric, its designer, projects using it, etc. Someone always has to start the chain of information and then others can help fill in the gaps and add to it. Once it's in the database, you can save it in your stash with other personalized information about it, like the quantity you have and whether it's been prewashed. Then when you need that information later on, you'll have it! A few people have asked, and yes, you must add the fabric to the database first to be able to stash it. When you add it to the database and then link to the fabric from a project using it, your project will then show up on the fabric's projects tab along with projects from other members using the fabric. This also gives your project the opportunity to be displayed as a "Featured project" for the fabric, which will put it on display at the bottom of the fabric's main page. The more fabrics there are in the database, the more useful the database will become. Need to find a turquoise quilting cotton with polka dots on it or a grey sweater knit made of wool? The powerful search filters on the database are only as good as the information in the database enables them to be! Fabrics in the database can be grouped in their respective fabric collections, and matching fabrics and thread can be linked on the fabric pages, so that as the database grows, it'll become a great resource for finding coordinating materials. As they are added to the database, fabrics automatically show up on the manufacturer's and designer's business pages. 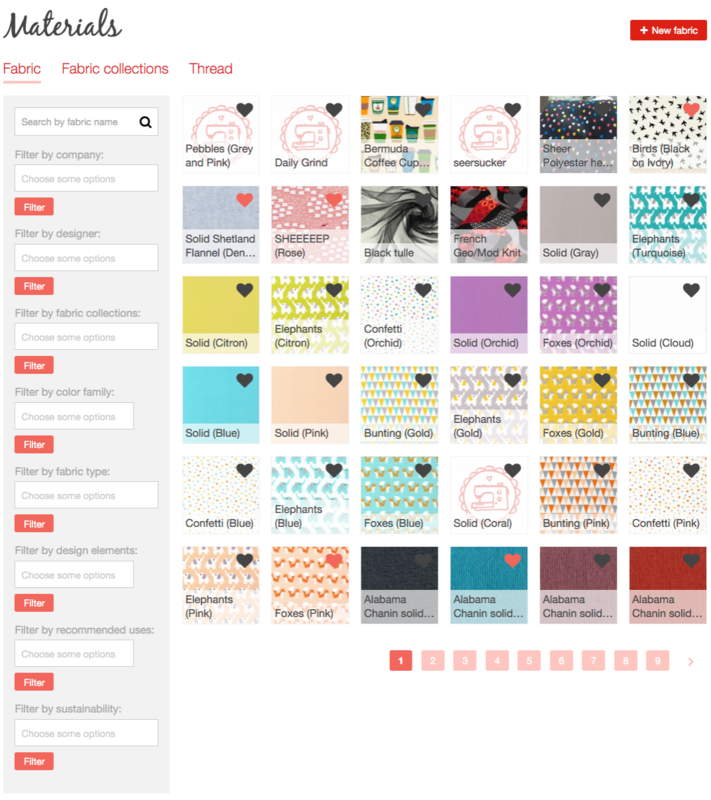 You can help out your favorite designers and companies, and share your love for them with the rest of the Textillia community by adding their fabrics to the database. 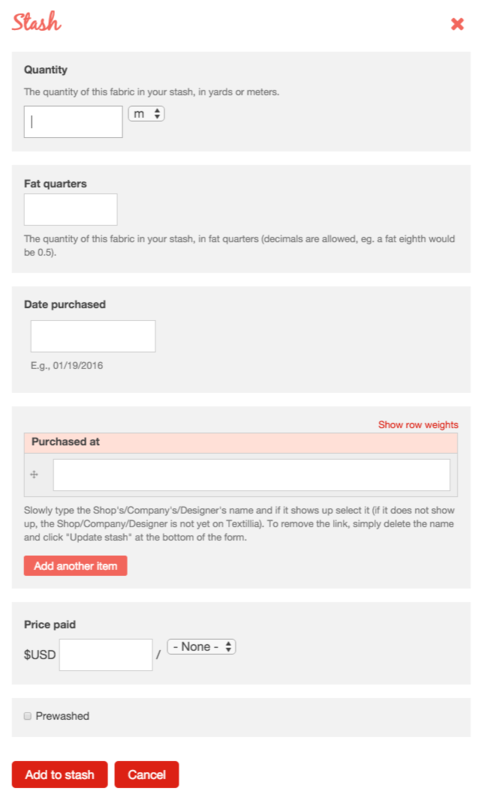 Ok, now that we've covered the why's, let's go over how to add fabric to the database! Most important of all: before you add, always search first! Until we get an automated search step implemented, it'll be important to always search first so we don't end up with duplicates, as they can cause a ton of hassle later on when they need to be merged. This happens. You inherit some fabric from a friend or buy it from a sale bin, and you have no clue what it is. It's time to be a scientist here: pull together all the data you have and see how far you can get evaluating what it is. Can you tell what it's made of? Cotton? Linen? Polyester? What type of fabric is it? Is it a quilting cotton? A stretch denim? Interlock? Corduroy? You can start there. What color is it? Is there a print on it or is it plain? Is it a woven or a knit? Any info is useful. First, plug it into the main search page and see if you see it in the database, if not, then go ahead and add it with as much information as you know - including one of the most helpful pieces of information, a photo! Just a couple days ago I was able to gather enough information from a photo (white fabric with black birds) and fabric substrate (poly crepe) that someone had entered to do some Google sleuthing and figure out the fabric was from Moda's poly crepe collection, and ta-da a mystery fabric was identified and I could fill in more information and add its fabric collection to the database as well. Also, this is a GREAT reason to always photograph the info on the end of a bolt when buying in person! If you want to go the extra mile, take all the info you have and do a Google search. Especially if the fabric is less than 3 years old, there's a decent chance that it will still be listed in a shop somewhere online and you may be able to figure out what it is. If you can't, just do your best to add all the info you can, and then save it. Maybe someone else will see it later and be able to identify it and provide some more details! A final note on mystery fabrics: do not make up information about them. If you don't know the real manufacturer or designer assigned name of the fabric, indicate that in either the title or the description. If you don't know the colorway or print name, do not fill it in at all - just fill in the color family and design elements info at the bottom of the fabric add form. Leave the designer and company names blank if you're not sure of them. As a general rule: when in doubt, leave it out (and optionally leave notes in the description instead). If you have absolutely no information about the fabric, then it may be best not to to add it to the database - we want to avoid generic items like "denim" or "fleece" with no additional info, as fabrics in the database should represent actual real life specific fabrics rather than a group or type of textile. But chances are that when you take a moment to break it down, you'll realize you have more information than you think. Adding a fabric collection is like setting up the container for all the fabrics that will live within it - it's good to be a bit meticulous. Just like with mystery fabrics, leave out any information you're not sure about, and fill in everything else that you can. If you are not sure about the design and colorway names but need to specify them to add an individual fabric (they are required fields when a fabric is added as part of a collection), note that it's not the official name in some way, like by calling it "Unknown - blue" or "Unknown - floral". Not every fabric will have a print or design name, so if it's a solid fabric, you can just add for example "Solid Laguna Jersey" as the design (if it was part of the Robert Kaufman Laguna Jersey collection). If you don't know the designer's name (as in the actual human who designed it), just leave it blank rather than entering something like "house designer" as then the website automatically creates a designer page for a person who doesn't exist! When in doubt, leave it out. Much like adding fabric collections, when you add individual fabrics you want to fill in as much information as possible, and leave out anything you're not sure about (you can add extra notes in the description). Photos help a lot, and there's a thread in the forums about photos if you're not sure when it's okay to use photos from a manufacturer or designer's website. Make the main image for the fabric a close up or swatch photo, so that people can get a sense of what it looks like from the smaller thumbnail that will show on search pages or other lists of fabrics (the first photo in the photo uploads list is always used for the main image). Always check the existing designs and colorways if it's in a collection, before adding new ones to the list. Add as much info as you can, but if you're not sure about something, leave it out and put a note in the description instead. Don't add a fabric to the database if you really have no info about it - generic fabric items in the database like "fleece" or "denim" should just be put in your project's description rather than adding them to the database, as the database is for actual real life specific fabrics, and not a type of fabric. 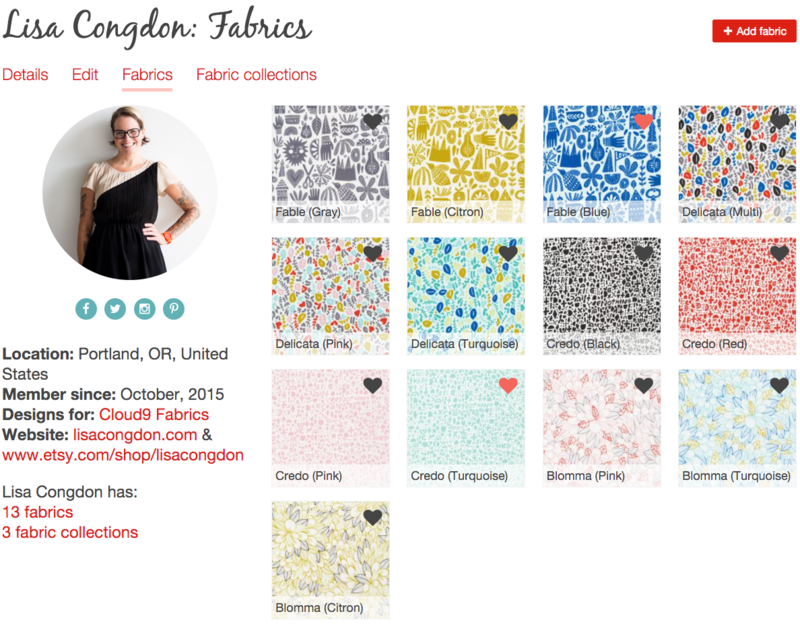 Keep the fabric and fabric collection content as de-personalized as possible. Use generic/manufacturer photos (rather than for example a photo of a finished item you made with it - that should go on your project instead), and save information like where you bought it for when you stash the fabric. If any of the fields are confusing, read the help text! There are additional pointers there. If you have time while you're at it, you can add several fabrics or even the entire collection to help build the database, especially if it's a favorite designer or collection of yours. It'll help other people discover it, and help grow the database! And most handy, whether it's been prewashed! In the future, we plan to make improvements to the stash page so you can see more info about your stashed items at a glance, but all in good time! I hope this has helped demystify the fabrics database for everyone - if you have any questions please post them in the comments and I'll do my best to answer them!